Energy giant BP has announced plans to develop two new North Sea oil fields capable of producing up to 30,000 barrels a day. The firm said investment in the Alligin and Vorlich satellite fields totalled around £420 million, with the two sites holding a combined 50 million barrels of recoverable oil equivalent. The fields, which are located close to existing infrastructure meaning they can be developed quickly, are expected to begin operation in 2020. Alligin, a two-well development west of Shetland, will be “tied back” or connected to BP’s Glen Lyon vessel. 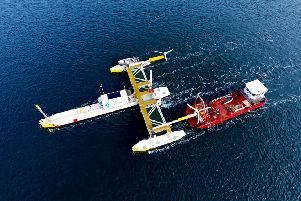 Vorlich, also a two-well development in the central North Sea, will be connected to the Ithaca Energy-operated FPF-1 facility. BP confirmed engineering firm Subsea 7 will install the Alligin pipelines, with work expected to begin next year. Meanwhile the company is “finalising its contracting strategy” for the Vorlich project. READ MORE: How much oil is left in the North Sea? BP North Sea Regional President Ariel Flores said: “Through our Alligin and Vorlich developments we are simplifying and accelerating the stages of delivery to improve project cycle time, reduce costs and, importantly, add new production to our North Sea portfolio. BP and Shell each hold 50% stakes in Allign, while BP has 66% of Vorlich alongside Ithaca Energy’s 33% share.